In the world of performing arts, hidden helpers are not that unusual. Stage managers and prompters, for example, ensure that a production goes flawlessly. On the other hand, it is not every day that one encounters hidden helpers of a non-human nature. 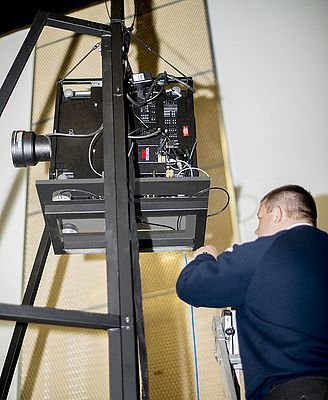 Welsh National Opera in Cardiff used air suspension isolators by ACE Stoßdämpfer to stabilize image projections. Viewers can feel grateful for this without a clue as to what is going on. 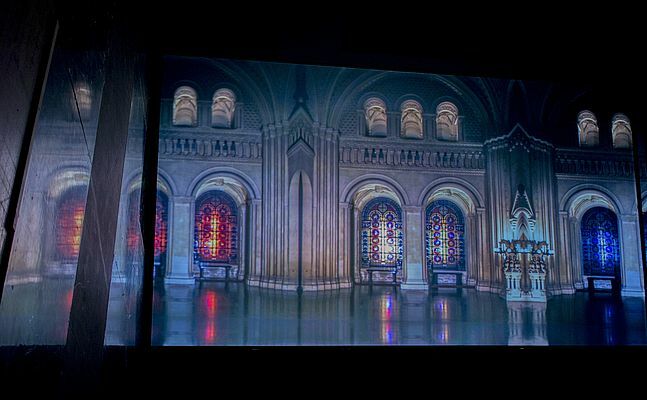 The plan of the show producers was simple: During the opera 'The Fall of the House of Usher', a 3D HDD projector would project images on a screen during the performance, this involved stage workers moving the running projector to different positions while the curtain was up. To make matters even worse, the floor on which the projector is moved on a trolley is tiled. Therefore, the problem to solve was how to maintain stable projector images with all of this movement over a tiled floor. With these conditions in mind, the opera producers invited several suppliers of vibration isolation products to propose a solution. It was, however, Craig Lancaster, the area manager of ACE for Wales and the west of England who came up with a quick and efficient solution when he visited the opera house; a solution he had on his mobile phone! He explained to the opera production team that ACE had developed an app called the VibroChecker that could measure vibrations in seconds and then suggest products suited for their isolation. 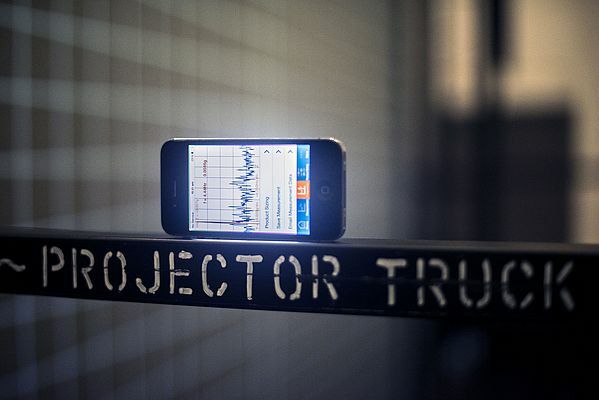 Craig launched the app, clicked on vibration measurement and placed his smartphone on the projector trolley. Langenfeld-based Dieter Wohlschlegel, a second ACE expert became involved in the measurement results, since in this special case ACE felt that international teamwork would lead to the best solution. 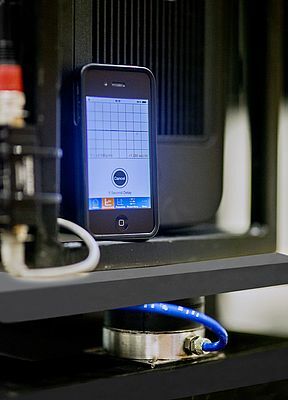 Craig emailed the measurement data in CSV format directly from the VibroChecker app to Dieter who could immediately commence evaluation and begin to work out detailed proposals for solutions. In addition, one can also use the app to collect the elevated values in the calculation mask on site, in order to then enter such significant reference data as machine weight, number of system surfaces and desired level of isolation in order to receive a list of suitable solutions from the ACEolator portfolio. Due to the low vibration frequency, the proposed solution from ACE was a 10 kg increase to the projector weight and the installation of three air suspension elements, model PLM1. These pneumatic air suspension isolators are part of the ACEolator product family. Depending on the degree of oscillation and the environment, three different product series consisting of the low frequency air suspension isolators, rubber-metal isolators and vibration-isolating plates are available to choose from. This makes it possible for designers to deal with virtually all challenges in the area of vibration isolation. According to the manufacturer's specifications, this also applies to machinery requiring secondary protection. 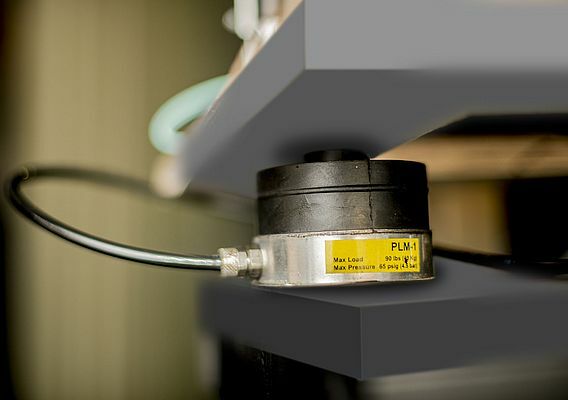 Like all air suspension isolators, PLM1s are categorised in the low frequency range and are used, above all, when there is a need to isolate measuring tables, testing systems and high-performance machinery. An internal air chamber guarantees significant isolation effects from as low as 5.0 Hz and upward. At 3.0 Hz, the natural frequency is at an optimally loaded level. This is achieved when the maximum load of the individual air suspension isolation is reached. Because this happened through the increased weight of the projector frame by 10 kg, an optimal payload for the three PLM 1s of 60 kg was achieved. For other purposes, PLMs with automatic level control valves can be supplied. In these instances, each main isolator has a built-in control valve that functions as load sensor and location sensor. In terms of the payload of the entire system, as many parallel air suspensions as desired can be added. This makes it possible for ACE to broaden the range of applications even more.